Friday night I had the pleasure of being able to spend the night in Oakland at one of my close girlfriend’s new house for a girls night. We made homemade pizza, drank wine, watched classic Halloween movies like The Craft and Hocus Pocus, all while wearing witches hats. Which as you can imagine made for a fabulous night! You can never be too old for slumber parties in my book. Something about reliving nights from your youth just makes you feel rejuvenated. Just to be able to leave behind the stress of adult like and reenact adolescence. Knowing that I had this amazing night ahead of me and since I was going to be staying the night in Oakland I decided had to try a new studio in the East Bay. Of course with working out in a new area I had to start my research process early. 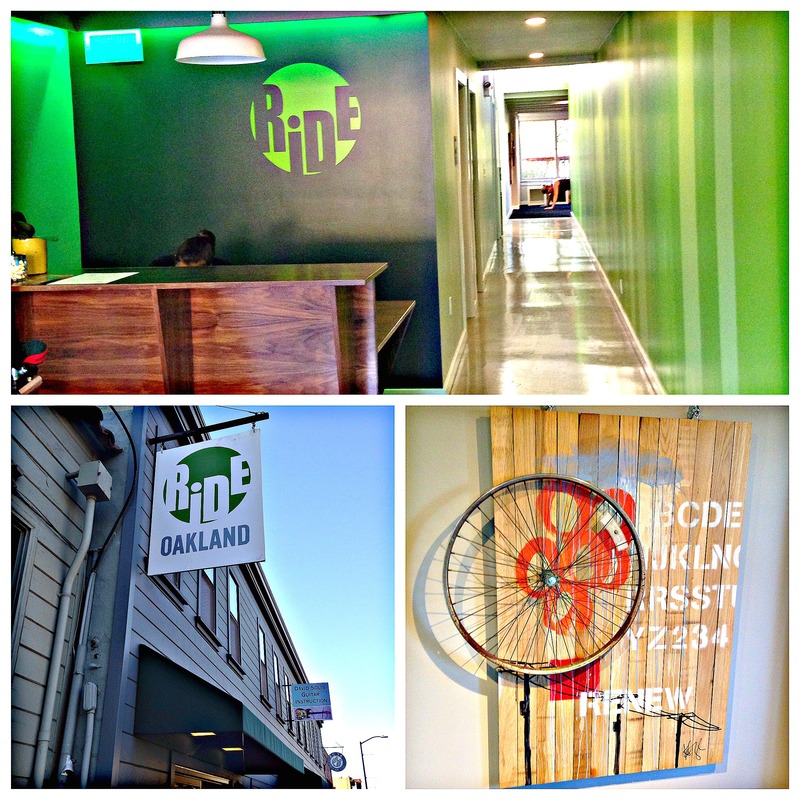 Fist I looked on yelp to find a place close to my girlfriends place and found Ride Oakland, a spinning studio only a few minutes away. Perfect! Next I checked my Class Pass site, yep it was one of the studios featured. Yes! Then it was about selecting the times. To my despair the 8:30 am class was all booked and only the 7:00 am or 10:00 am were open, both not ideal times. I looked at the studio website and saw you could try your first class for free there. I gave the studio a call hoping I could get on the wait-list. Sure enough I was able to and got a confirmed spot later in the day. Saturday morning with a slight headache and only 5 1/2 hours of sleep I got up, threw on my gear, and made my way over to the studio. Parking was super easy, something I am no longer accustomed to in my new neighborhood. It felt like a luxury to not have to drive around the block several times before finding a space. Walking into the studio I could immediately picked up on the neighborhood vibe, however the studio also felt new, modern, and up to par with some of the nice mainstream studios in the city. The crowd was slightly older then what I am used to in the city, however Helen the instructor had great energy and definitely kept us all on our game for the full hour. The music was great and the class utilized weights, which I am a big fan of in spinning classes. It creates an extra added benefit. By the end of the ride I was sweaty and quite pleased with my overall workout. Also my headache was gone! I would highly recommend this studio out to others. I don’t know if I would ever make my way to the East Bay just for this studio, but if I happen to be over in the East Bay I would go again!